Toddington-Harlington Stn Circular Walk at Toddington Walking RouteAn attractive circular walk across farmland with views to Harlington and Toddington. Accessible from Harlington Rail Station. 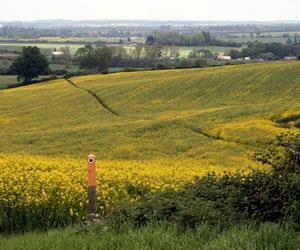 An attractive circular walk across farmland with views to Harlington and Toddington. Accessible from Harlington Rail Station. How to get there by car/Parking: The A5120 passes through Toddington which is just under a mile south west of junction 12 of the M1. There is restricted and unrestricted on-street parking around the centre of Toddington and Harlington. Harlington Station car park is chargeable.